The ECB kept its benchmark interest rate unchanged at its monthly meeting. Nonetheless, President Mario Draghi reaffirmed his pledge that the central bank stands ready to take the necessary measures to fight off the risk of deflation. That statement sent the shared currency sliding 46 points lower against the US dollar to $1.3720. The final GDP numbers for the Eurozone indicated that the economy grew by less than initially estimated (0.2% vs 0.3%) supporting the ECB view that the common area is not out of the woods yet. That put forex investors on guard about being too enthusiastic with the shared currency ahead of today's ECB interest rate meeting, and so the EUR/USD pair lost 27 points to $1.3766. A larger than anticipated drop in German unemployment was a breath of fresh air for the Eurozone's economy, pushing the shared currency up versus the US dollar for the third straight session. However, ahead of tomorrow's ECB interest rate meeting, CFD market participants are reluctant to add to the existing bets hence yesterday's slim rise of 21 points to $1.3791. Inflation in the Eurozone during March slowed by more than expected, coming in at 0.5% vs 0.6%, and hit the weakest level in 4 years. This has put the ECB under mounting pressure to act as the central bank has a target inflation rate of 2%, meaning that the current levels can hardly be called 'price stability'. 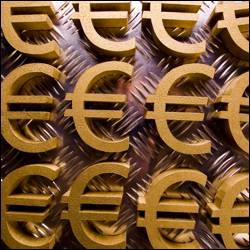 Despite this, the euro was rather flat, ending just 10 points higher against the dollar at $1.3771. As the German inflation numbers were slightly weaker than expected, the euro moved up against the dollar, ending 13 points higher at $1.3753. The ECB President emphasized in a speech earlier in the week that the central bank stands ready to take additional monetary steps in case of any downside risks.